Set of 3, Scott 31-33, MNH. 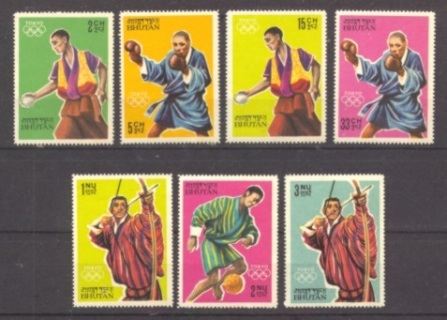 The Bhutan Stamp Agent in the Bahamas prepared this set as a Kennedy memorial. The Bhutanese did not approve it for release, but tolerated its use on mail (posted in Bhutan with stamps bought in the Bahamas) after the arrival of stocks from the agent's printer. The P&T eventually relented and quietly placed the stock on sale that it had received. The issue, once on sale, was promoted as a general memorial issue to honor all of those who died in the service of their countries. 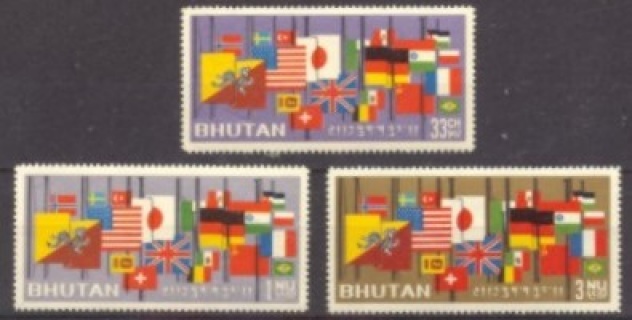 It was anticipated by the agent that set set would also be supplied and officially sold by the Bhutan post office in imperforate format. But, the imperforate varieties also remain today as only tolerated versions; see the Errors and Varieties pages. Two of the values were issued in a souvenir sheet. Stamps removed from the souvenir sheet are perforated 13.5, and can be distinguished from the sheet stamps which are perforated 14.5. Stamps from the imperforate sheets cannot be distinguished from imperforate stamps removed from the imperforate souvenir sheet.